Bergen: UK officials not releasing the name of the killer "for operational reasons"
Editor's note: Peter Bergen is CNN's national security analyst, a vice president at the New America Foundation and the author of "Manhunt: The Ten-Year Search for bin Laden." (CNN) -- He has beheaded again. 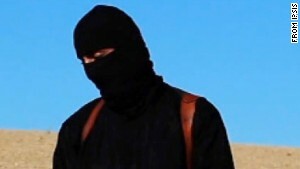 The tall, masked British man with the London accent, working with ISIS. His first two victims were American journalists. 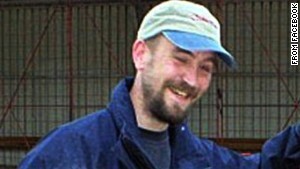 His third was a fellow citizen, British aid worker David Haines. British Prime Minister David Cameron hastily assembled a meeting of his top national security advisers in the early hours of Sunday morning to discuss what can be done. 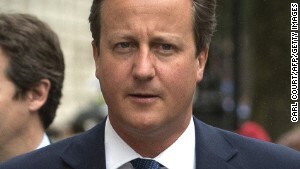 According to British officials, Cameron knows the identity of the British executioner. Who is the ISIS executioner? He also knows that the executioner has already killed two citizens of his country's closest ally and he knows that the executioner holds at least two other American citizens. Cameron knows that the executioner holds other hostages from additional Western countries and that he is part of a larger group of British hostage-takers working for ISIS, nicknamed "the Beatles" by their captives. And he knows that the lives of the remaining hostages are in grave danger. It is a real crisis for Cameron, and it underlines a sobering fact: British citizens have volunteered to go to Syria to fight at 25 times the rate that Americans have done so, when adjusted for population size. Some 500 British citizens have traveled to Syria to fight, as have 100 Americans. The population of the United Kingdom is about a fifth of that of the States. 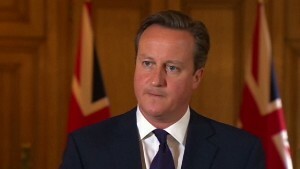 A British government assessment by the Office of Security and Counter-Terrorism provided to CNN shows that the British have already arrested 69 people this year for "Syria related terrorist offences" that include terrorist financing, preparing an act of terrorism, and attending a terrorist training camp. 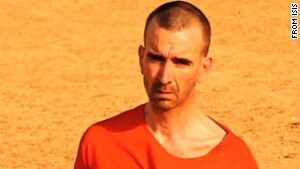 Who was British aid worker David Haines? In 2013, 25 people were arrested in the UK on similar charges, bringing the total number of arrests to 94, according to the British government assessment. By contrast, only eight have been arrested for similar Syria-related terrorist crimes in the States. The war in Syria is attracting British fighters from all kinds of ethnic backgrounds, not just those of Syrian descent. A British official told CNN that the vast majority of British fighters going to Syria do not have any real links to the country other than a desire to fight in a holy war against the Bashar al-Assad regime. Alarmed by the threat posed by its citizens fighting in Syria, the British government has already refused to issue or has cancelled 23 passports and has also revoked the citizenship of eight British citizens, according to the Office of Security and Counter-Terrorism. The British agency also underlines the threat posed by other European citizens who have traveled to Syria, who can freely travel around the European Union, including the UK, and who can also travel to the States without visas as they are from so-called "visa waiver" countries. According to the British government, 700 fighters have traveled to Syria from France; 400 from Germany; between 300 and 500 from Belgium; 130 from the Netherlands; over 100 from Denmark; 100 from Austria; 80 from Sweden; and between 50 and 100 from Spain. The British government also estimates that 100 Canadians have left Canada to "support or train with terrorist movements abroad. The majority of these are likely to be in Syria." And it estimates that there are 60 Australians fighting in Syria and Iraq and about 100 Australian "facilitators" helping to make this possible in Australia. This brings the total number of Westerners who have fought in Syria to between 2,620 and 2,870, according to the British Office of Security and Counter-Terrorism assessment obtained by CNN, which is likely the most authoritative estimate yet. Despite the fact that the British government has identified the executioner of the two American journalists and of David Haines, it is not making his name public "for operational reasons." That's because the only likely hope for the remaining hostages is some kind of rescue operation similar to the one that the U.S. Joint Special Operations Command mounted on July 4, which didn't achieve its purpose because the prisoners had been recently moved from the location where they were being held in Syria. A rescue operation is a long shot, but at this point it may be the only real chance of saving the lives of the remaining hostages. David Cameron knows this -- and so does President Barack Obama. The latest ISIS-appointed governor of Mosul was killed in coalition airstrikes on Christmas Day, according to Iraqi police. Author Juergen Todenhoefer says ISIS are "more dangerous than people realize." There's yet another new name for ISIS among those fighting against the terror group. Daesh. The FBI warns U.S military that ISIS are looking for individuals who may be interested in carrying out attacks on home soil. Iraq's Prime Minister says there is evidence of 50,000 soldiers being paid while inactive. Pentagon insider Ashton Carter is expected to be President Barack Obama's nominee for Defense Secretary. Just two weeks ago, Yasir was regularly strapped into an explosive vest and handed guns and a radio to stand guard at an ISIS base in Syria. How did three U.S. teenagers become radicalized? CNN's Pamela Brown reports. Why is ISIS so attractive to recruits? Reza Aslan examines the appeal of ISIS and why the group is able to successfully attract so many recruits. Travel ad or pro-ISIS video? A new propaganda video from ISIS features a Canadian ISIS member who died in combat. Explore CNN's interactive that explains ISIS' roots, what it controls, and where its support comes from.